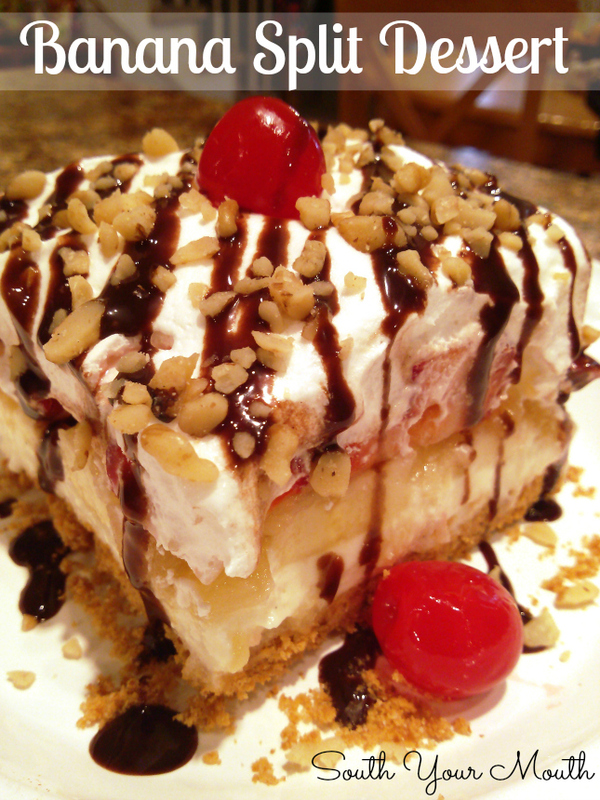 Classic Banana Split Dessert with cream cheese filling, pineapple, strawberries, chocolate syrup and nuts. I have been plagued with cravings for a banana split. Like, to the point I wondered if I was pregnant. Mom, I'm not, you can get up off the floor now. A craving hit me at work one day hard. Me: Man, DANG. I want some ice cream. Me: I want a banana split. Brooke: Yes!!! With pineapple. And nuts! Me: You like nuts too?? Me: Hahaaa… I know, I love them! But nobody likes nuts these days. Brooke: Let’s see if they (the bosses) will go get us some ice cream. Me: You do it! They like you better. After one very well written email pointing out what stellar employees we are didn't work, we resorted to begging on Facebook and tagging their wives in our pleas. And then mentioning it every single time one would walk by. Man, I surrrrre would like some ice cream. You know what would be good right now? Ice cream. I bet I could work twice as much work if I had a little ice cream. Let the record show we did not receive any ice cream. After a good week and a half of trying. And I’m pretty sure the wives would be VERY UPSET to know this. That was like two weeks ago. And do you think I got over my craving for a banana split? Nope. But it wasn’t really the ice cream I wanted. I wanted all the toppings. Then I remembered this dessert! I whipped one up and have been verrrry happy ever since. Banana split craving cured! I even brought some in to work. But just for Brooke. The bosses are not allowed to have any. At all. Ever. Mix together graham cracker crumbs, melted butter, 1/4 cup sugar and salt then press into the bottom of a 13x9 baking dish. Bake at 350 degrees for 10 minutes. Remove from oven and cool completely. Whip cream cheese, vanilla extract and remaining 1 cup of sugar with an electric mixer until fluffy. Fold in 1 cup of cool whip. Spread cream cheese mixture evenly over graham cracker crust. Make sure your cream cheese is good and soft or you'll have a hard time spreading the mixture over the graham cracker crust. Arrange banana slices in a single layer over cream cheese mixture. Top bananas evenly with crushed pineapple. Arrange strawberry slices in a single layer over pineapple. Spread remaining cool whip over dessert. Make sure to go all the way to the edges with the cool whip – this will seal things up so the bananas don’t brown*. Refrigerate for 2 hours before serving. To serve, sprinkle with nuts, drizzle with chocolate syrup and top with cherries. OMG! Did I read something about you wanting a banana split on facebook and you got my craving going, or is that craving just going around?? I asked my mom last weekend for the recipe to the banana split pie she used to make! Your dessert sounds delicious, and could cure my craving!! Just found out recently that you could soak your bananas or apples in lemon/lime soda to keep from turning brown. Try it! It works!! I made it last weekend and you don't need to do anything to the bananas since the pineapple keeps them from turning brown. I still have 1 slice left in the fridge and the bananas are perfect! Thank you so much for this! I made it last weekend and it was a huge hit! So yummy and looks amazing! All of the kids asked for a second helping. This has become my go to dessert! Absolutely scrumptious and on the most requested list from family, friends, and coworkers. Thank you for sharing.